Showers have traditionally used tile as their building blocks for durability as well as aesthetic appeal. 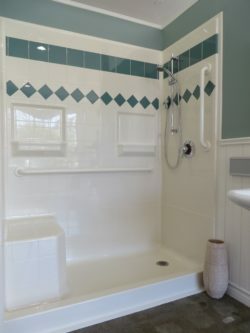 But working with and maintaining a ceramic tile shower has its downsides, especially when it comes to a handicap shower. Tile shower installation is meticulous. Tiling a shower perfectly is not a job for the weekend handyman. Getting the mud slope right for the drain is especially tricky. Unless you are a professional this will take time, and if you hire a pro it will take money. Tile shower walls need to be reinforced. Handicap barrier free showers have more accessories than a regular shower. A folding seat or a grab bar will need to be sturdy enough to support body weight. That’s why tile handicap showers also have to have plywood backing for strength; this adds time, difficulty, and (again) money to the job. Tile shower warranty is limited. The tiles themselves may last a long time, but even a professional installation will give you only a couple of years warranty (if you’re lucky) on the labor. Handicap showers are often under heavier use than a normal shower, resulting in more wear-and-tear. 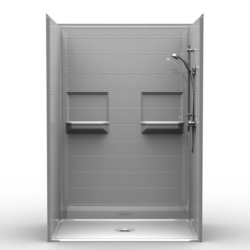 The good news is that ORCA handicap accessible barrier free showers maintain the great looks of a tile shower without all the hassles. The wall units literally snap-together and provide a leak-free seam. The drain is pre-leveled and the walls are already reinforced with plywood. Finally, the whole barrier free shower unit has a 30 year limited warranty. Now you know why to choose ORCA showers over a standard tile shower. Previous Previous post: Handicapped Showers : Need it Now ?